Long lines at checkout are common at grocery stores. 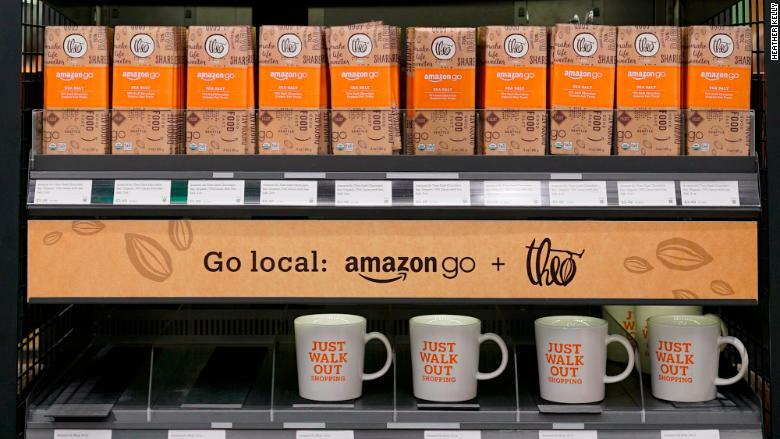 But at Amazon's new cashier-free store, you'll only need to worry about clumps of tourists. 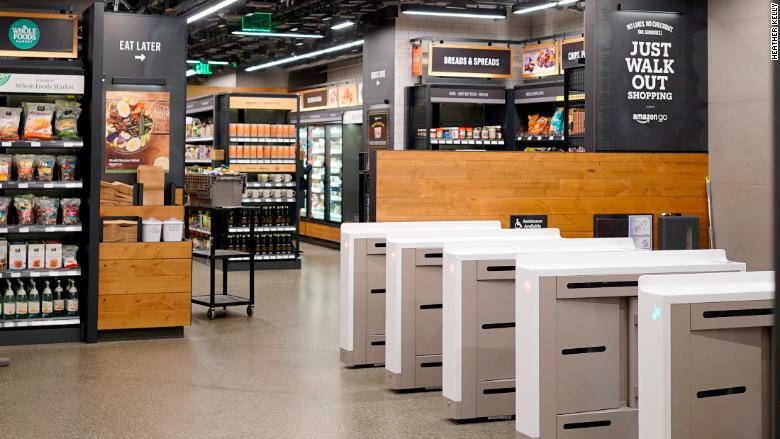 The small test store in Seattle, which opened to the public for the first time on Monday, could be what automated shopping spaces will look like in the future. It uses cameras and sensors to detect what food you've taken from a shelf, then automatically charges you when you walk out. I stopped by to try out the store, located in the base of Amazon's corporate skyscraper, on Thursday morning. Three days after its grand opening, the massive lines had mostly disappeared. There were only a handful of shoppers inside at 10:15 a.m., but business picked up at lunchtime and there was a short line to enter. You enter the 1800-square-foot space through six high-tech turnstiles. Open the app and wave a code on your screen above a gate to open it. It's a familiar experience to anyone who has ridden a subway or used a mobile boarding pass at the airport. The second you're inside, Amazon begins tracking your movements. Every kombucha drink or bag of taro chips you take off a shelf is added to a "virtual" shopping cart. The store's system knows if you pick something up and put it back. The shelves are primarily stocked with packaged and pre-made foods. There are Amazon meal kits, sandwiches, snacks and basics like flour and coffee beans. You can grab a souvenir mug with the store's motto, "Just walk out shopping." There is not much fresh produce, probably because tracking loose apples and other items sold by weight is tricky without a scale. Personal items are also limited -- if you were hoping to avoid the awkwardness of buying condoms from a human, you are out of luck. I used one of Amazon's orange shopping bags, but you can also shove the items directly into your own pockets or purse. Walking out through the turnstiles is even easier and faster than coming in. The store knows you've left and tallies up what items it's seen you take, charging your account. There's the brief sensation of feeling like you got away with something, but then Amazon sends a push notification about your receipt. Even though the store's done away with cashiers and baggers, there are plenty of human employees milling around in bright Amazon Orange. Stockers regularly refill shelves and one person checks IDs near the alcohol. Outside, greeters hand out reusable shopping bags and answer questions. The store's design feels familiar if generic, like a miniaturized Whole Foods. That is, until you look up. The ceiling is a dark crisscross of wires and metal beams holding around 100 square black cameras. Amazon isn't sharing too many details about how its technology works, but it has denied using facial recognition for people tracking. The shelves have sensors and know when something is removed. You can pick things up and put them back, and you won't be charged. "I was curious to see it. I assume in a short time there's going to be a million of them taking over the world," said LaRocca. 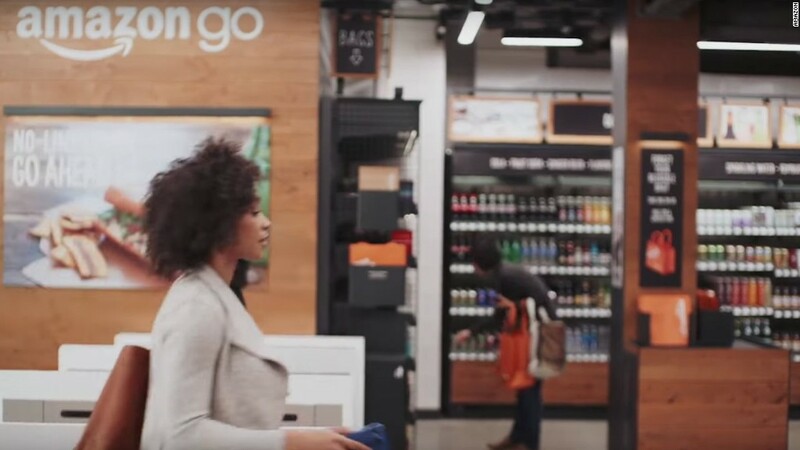 For now, the novelty of Amazon's first automated grocery store is eclipsing potential issues that may come up. Because it requires an account and smartphone, it could be inaccessible to many lower-income shoppers. The tracking technology may raise privacy and data collection concerns. And then there's the 3.5 million cashiers in the U.S. making around $9.70 an hour who could eventually lose their jobs to automation. "I think I would miss that," said Bejjani. "At the end of the day, the people who are shaping the world work in technology, and they are more comfortable with [automation] instead of small talk."